Currently available are three audio files of an original spoken lecture. And his unique explanation of the inner meaning of the Gayatri Mantra. Hear his holy voice in discourses, chanting and reciting from the Scriptures. by Sripad Bhakti Sudhir Goswami Maharaj in Nabadwip on the occasion of Srila Bhakti Sundar Govinda Dev-Goswami Maharaj's 74th Anniversary Apperance Day, 10 December, 2003, with a few words at the beginning and end by Srila Govinda Maharaj. by Sripad Bhakti Pavan Janardan Maharaj in Nabadwip on the occasion of Srila Bhakti Sundar Govinda Dev-Goswami Maharaj's 74th Anniversary Apperance Day, 10 December 2003.
by Sripad Bhakti Sudhir Goswami Maharaj in Nabadwip on the occasion of Srila Bhakti Raksak Sridhar Dev-Goswami Maharaj's 108th Anniversary Apperance Day, 19 October 2003.
after accompanying Srila Bhakti Sundar Govinda Dev-Goswami Maharaj on his Twentieth World Tour. Hear his holy voice in discourses, in chanting and in reciting from the Scriptures. Plus some sound files by other devotees. Srila Govinda Maharaja offers deep insight into Srila Sridhar Maharaj's unparalleled explanation of the Gayatri Mantra: Krishna's flute is singing the song of service to the lotus feet of Radharani (gayatri muralista kirtana-dhanam radha-padam-dhimahi). Dum Dum Park, Calcutta, 28 February 2002.
on 11th August 2002, during his 19th World Tour. London Sri Chaitanya Saraswat Math, 25th July 2002. Today three devotees received sannyasa initiation from Srila Bhakti Sundar Govinda Dev-Goswami Maharaj. 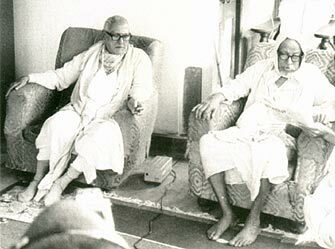 This sound file is an informal talk given at end of last year where Srila Govinda Maharaj describes a topical story of a debate between Srila Bhakti Raksak Sridhar Dev-Goswami Maharaj and a cousin. In the Vaishnava Calendar today (25 May 2002): (Sat) 28 Madhusudan. Gaura-chaturdasi. Sri Nrisimha-chaturdasi: Appearance day of Sri Nrisimhadev. Full fast until after sunset, then no grains (anukalpa). at Sri Govinda Dham, Murwillumbah, Australia. Accompanied by a full transcription. In the Vaishnava Calendar today (14 May 2002): The Appearance Day celebration of Tridandi Swami Srimad Bhakti Vichar Jajavar Maharaj. in 1987 at Sri Chaitanya Saraswat Math, Nabadwip. in early June 2001 at Sri Chaitanya Saraswat Math, Nabadwip. 15 minute discourse recorded 2 April 2002.
a gathering of devotees from around the world. at our Temple in Dum Dum Park, Calcutta. The first of two parts of this lecture on the Web. Uploaded the next day: Part Two of this lecture. 18th World Tour: Russia, June 2001. If you want to satisfy the Lord, you must try to satisfy His devotee. with simultaneous translation into Russian. in Sri Chaitanya Saraswat Math, Nabadwip, on 5th January 2002.